Indexing was my thought for 2 layer boards. 1) Set up your stand-off holes in each corner of your PCB design. 2) Do everything to get the top layer toner transferred onto the PCB or just stick the top sheet in place (heat resistant clear tape?). 3) Drill pilot holes through the board at te centre of each stand-off. Size to be for a 0.1" male header. 4) Print off the bottom layer. 5) Place bottom layer print onto a block of wood and drill the same 4 pilot holes though the paper/vinyl/laminate. 6) Place 4 off 1x1 headers through the PCB from top layer and turn the board upside down. 7) Place your bottom layer print over the 4 keys to line up perfectly via the centres of the stand-offs. Stick the bottom layer in place (heat resistant clear tape?). 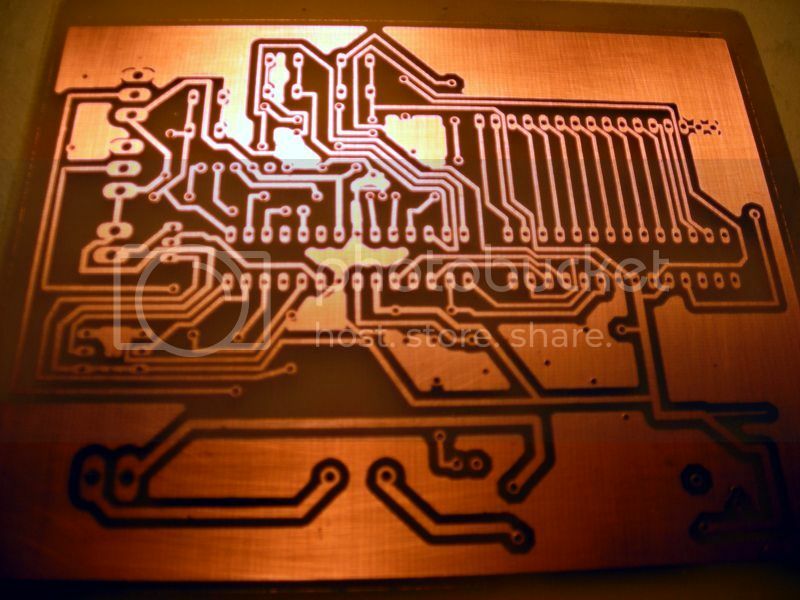 9) Heat transfer the toner onto the copper via heat press, iron or laminator. 10) Remove both sheets of paper/vinyl/laminate and the 4 off 1x1 headers used as keys. 12) Hopefully a perfectly aligned two layers. I've not tried it yet but I think it should work? I've ordered vinyl from the link I posted. So far, all comments and reviews I've read on the web shows this process to be a "winner" and almost foolproof. 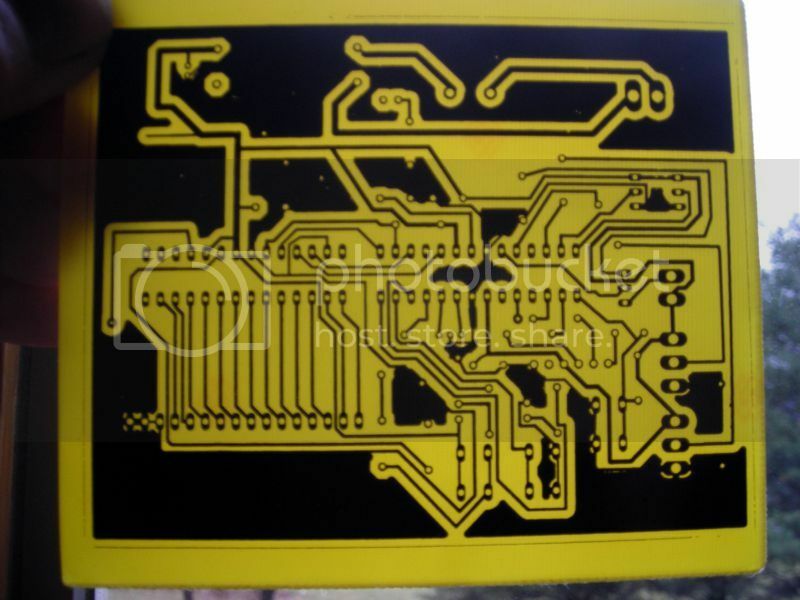 I'm going to try to getting back to home-etched PCBs for simple prototypes. Sweet find man. Can you post some pics of the etched board? I've always been skeptical of the accuracy of home etching since it seems perfect masking is difficult to achieve. I'd love to see how well it turns out using your method. I'm cheering for you over here. If this works well, I would really like to start doing prototypes at home. I keep packing things tighter and tighter though, so precision is important. I didn't have any vinyl laying around, but I had CON-TACT brand "self adhesive decorative covering" so I tried that out, with low expectations. After shoving it through the printer (not a fun experience) I ironed it on max heat like I do with photo paper. The paper came off easily under warm water but some toner stayed on the paper (mostly on the edges, forgot to take a picture). The finish looked a bit rough and I was worried that I had microscopic holes all over, (like I'd heard about elsewhere) so I etched part of it. No microscopic holes as you can see. The distance between traces in the red circle is less than .2 mm, I had no problems with the paper sticking there. Cool. Thanks for that. How are you cutting your boards, btw? I have my own methods, but I always wonder what other people do. I use a dremel with the thinnest cutting wheel I have. It's certainly not the best way, I'm sure, but I can't think of any other ways to cut out an exact shape. Just gotta make sure I hold my breath! Why not clamp it in place and take a hacksaw to it? That's what I do. I use a Jig Saw. Though I'm tempted to make something like this. Definitely good enough for prototyping! :-) Thanks for sharing. I'll try the hacksaw thing too. I've thought about that before and dismissed it due to some panels not being complete end-to-end cuts, and I'm not sure how to start without wobbling around the cut line.